I’ve been totally blown away by my recent selection as one of Westpac and Financial Review’s 100 Women of Influence for 2014. 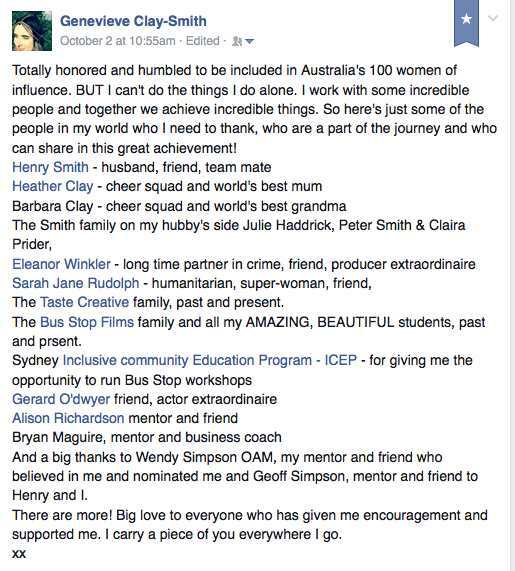 It’s very humbling to see my name listed amongst so many other incredible Australian women doing great work and achieving unimaginable heights. My dear friend and mentor, Wendy Simpson OAM nominated me for the honor and just to be thought of as worthy was so encouraging on it’s own. To have actually made the list – is just… wow. But while it’s lovely to be acknowledged, it must be said, that there’s no way I’d be able to have this honor and achieve what I have achieved without my incredible work-mates, collaborators and colleagues who also carry the vision of Bus Stop Films and Taste Creative, shoulder-to-shoulder with me. I was recently asked at a forum, “how do you do it all?” And I answered quite simply, “I don’t”. The honest truth is, that I don’t do it all. GASP. I am no superhero and I very much like watching reality TV and eating chocolate at the end of the day. I don’t work 24/7, and push myself like some crazy-overachieving-work-horse, rather, I work with a team of amazing, like-minded people and together we achieve great things and produce awesome work. In fact, there is nothing better than working with other people who you just ‘click’ with. It’s the most exhilarating and wonderful experience to work in a team that is passionate, creative and operates like a well-oiled machine. I believe that people are the key to unlocking one’s future. On the other side of a person is an big break, a word of encouragement or, a word of advice. No one can do anything by themselves and certainly, that’s been my experience. In my journey so far, people have been the doors to opportunity and adventure. It was a friend and mentor who told me to enter Tropfest, when I wasn’t going to. Had they not have suggested I enter, I wouldn’t have, and subsequently an incredible chain of events (including winning the festival) wouldn’t have happened. It was my friend and collaborator Eleanor Winkler who told me to apply for the Young Social Pioneers, run by the Foundation of Young Australians. Had I not have applied and gotten in, I don’t know how Bus Stop could have developed further as a registered not for profit organization with DGR status. It was my husband who decided to a business course with me and start Taste Creative, had he not taken a leap of faith to work with me, we wouldn’t enjoy the blessing of owning our own creative agency today. And they are only a few of many, many more examples. No great thing is ever accomplished in solitude. If I could go back to my 17 year old self at university and tell her “hey, your future doesn’t actually depend on your own strength, your own ideas, your own skills (or lack of skills)”… I think I would have had less stress-rashes, migraines and bouts of nausea. Striving for success can be a trap, you can burn out and get wrecked. Late nights drinking V and forgetting to have meals because of being busy, trying to ‘do it all’ will take it’s toll eventually. I am very grateful to work with many beautiful and talented people who I can trust in and rely upon. They have skills I don’t and I have skills they don’t, it’s what a team is, people who compliment each other with their varied, versatile and unique skill sets. Equally, I’m very blessed to have a supportive family, who encourages me. If my mother had never instilled a deep sense of ‘anything is possible’ in me, I don’t know where I’d be. So, Here is a little Facebook post that I wrote, to honor the amazing people in my life that have been a part of the journey – and they are only a few of many. So if you too dream of achieving great things, find and work with great people. Admit that you don’t know everything, that you’re not a genius, admit you need help when you need help and enjoy the ride with a team, so together, you can celebrate the highs and support one another during the lows.